Based in Singapore, Asia Pacific Centre of Management Education offers customized management education solutions to its client’s through-out the Asia-Pacific region. We are an innovative and people-centered organization which understands today’s competitive business environment and brings innovative and world-class education solutions to help its clients achieve excellence in their business sector through growth and sustainability. Our client base consists of both public and private sector organizations and our core areas of business are executive education, specialized programs for business schools and B-school faculty training & development. As an education service provider in Asia, we have the trust and support of the top universities of the region. We value these relationships and are committed to protect the reputation of our partner universities. Our strength lies in close relationships with the universities and faculties that enable us to design programs based on the unique needs of our clients. This allows our clients to add specializations at a fraction of the cost of hiring and maintaining in-house faculty resources. We strive to offer our clients some unique benefits that set us apart from the competitors. Synergy – The conventional education programs rely on in-house trainers, whether university faculties or professional trainers. APCME brings synergy to its clients by bundling the best available resources in the region from various universities (academic resource pool) and professional bodies (industry resource pool) to deliver the program which provides a comprehensive coverage thus bringing best value for the investment. 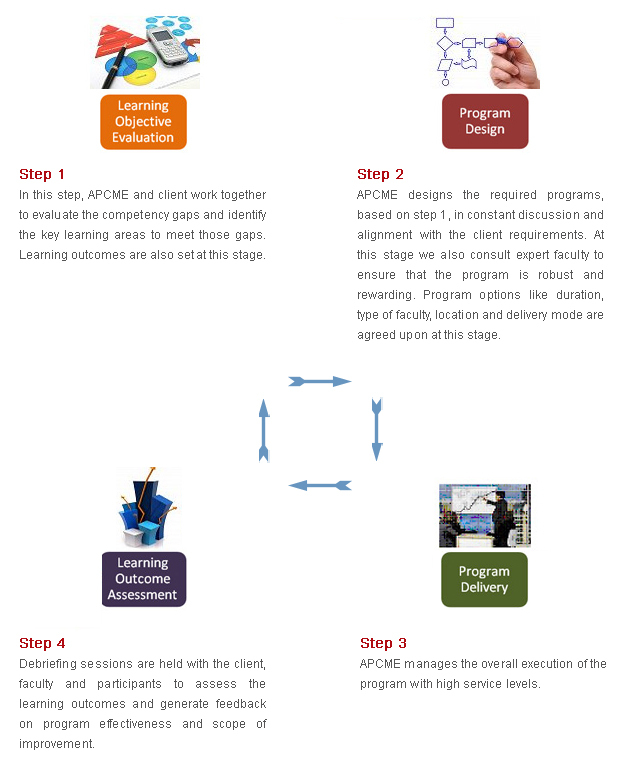 Geographical Scope – Based in Singapore (a global education hub), APCME works with many top ranked universities and industry experts across the globe (US, UK, Australia) to bring a truly global education experience to its clients unlike the conventional programs which rely on faculties from a single geography. Professional Certifications – APCME programs are offered in partnership with professional bodies and universities which lead to professional diplomas and certifications of international reputation that add recognition/prestige to the profiles of the employees/participants completing these programs. International Exposure – APCME education programs come with an option of international learning experience with overseas study trips, industry visits and workshops which accords truly global exposure to the participants. Singapore is a melting pot for cultures and traditions and an ideal place to learn and contrast western and eastern management practices. Singapore is also a regional hub for many industry sectors like tourism, logistics & shipping, healthcare, media, banking & finance and real estate, and provides unmatched partnership, learning and growth opportunities for management professionals. The logo of APCME has three colours: Red, Blue and Grey and each colour is a symbolic representation of the ideology and the beliefs that defines APCME as an organisation. The Red colour represents culture and integrity. APCME believes in a culture that is focused on clients needs and nurtures excellence in everything we do. We believe in working with an integrity of the highest order with our clients and partners. The Blue represents stability and a drive towards enhancing productivity, a value we believe in when designing solutions for our clients. The usage of ‘Greek letter alpha’ in lieu of alphabet ‘A’ marks the beginning of new possibilities trending towards infinity. The Grey background highlights our focus on creating and distributing knowledge (Grey matter) and the letters are italicised to depict the adaptability and forward-looking approach of the company.